Wells Fargo was founded on March 18, 1852 when Henry Wells and William Fargo founded Wells, Fargo & Co. to serve the West. The new companies offered banking (buying gold and selling paper bank drafts as good as gold) and express (rapid delivery of the gold and anything else valuable). The name Wells Fargo is forever linked with the image of a six-horse stage­coach thundering across the Ameri­can West, loaded with gold. Wells Fargo understands that in order to be successful in business, they must support the communities they serve. Through corporate and foun­dation grants, they share success by investing in nonprofit organizations that address vital community needs and issues. Through the Community Connections Program local stores are given the opportunity to select non-profits of their choice to receive Wells Far­go Foundation grants. Awards are distributed at a Community Connec­tions Program Recognition Breakfast. In 2015 One to One Learning was a recipient, provided through the Nyack store. One to One Learning has a close con­nection with Danielle Torres, manager, and the staff at the Spring Valley store. Ms Torres and a staff mem­ber had volunteered as teachers of ESL at One to One Learning. Subse­quently they have provided financial workshops to students from 7 to 8 PM before English classes begin. In these mini-courses they provide information on budgeting, financial planning, importance of developing a line of credit, and starting checking accounts. Students are comfort­able with them, asking questions in Spanish. 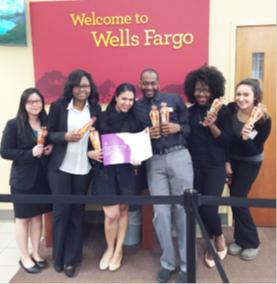 One to One Learning proudly honors Wells Fargo with the 2016 Corporate Service Award for reaching out in service to the community through grants and educational workshops.